Good winter management practices contribute to healthy and productive cattle, reasonable feed costs and humane care of feedlot cattle. 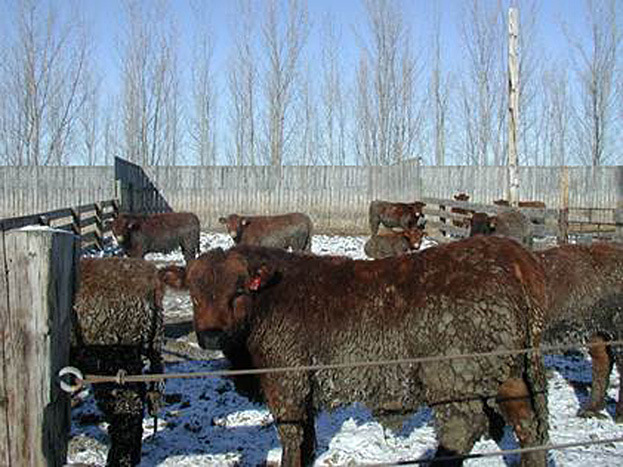 This publication describes recommended management practices for feedlot cattle in the winter. In the northern Great Plains, winter is a fact of life during which severe cold temperatures, frequent dangerous wind chills, and blowing and drifting snow commonly are experienced. Conditions can vary daily, and some winters are worse than others. Animals increase body heat production as a response to severe cold exposure by increasing their metabolic rate (heart rate, respiration and blood flow). The practical result is potentially lower gains and reduced feed efficiency, even with increased feed intake. Beef cattle adapt to colder temperatures during gradual changes in the season by growing longer hair, changing metabolism and hormone secretion (NRC, 1981), and depositing insulating fat if the energy level in the diet allows. A clean, dry hair coat and protection from the wind are very important factors that help cattle tolerate extremely cold temperatures. Feedlots have some advantages to feeding cattle in the northern Plains states. Summers in the northern Plains are very pleasant. A wide variety of feed grains, coproduct ingredients and forages are available at competitive prices, and rural areas are sparsely settled. Certainly, severe cold and wind can impact performance negatively, but feedlot managers can mitigate these conditions to some extent with proper planning, facility design and good management practices. Fall and spring in the northern Plains can be challenging seasons for feeders because wet, cold conditions negate the natural insulation value of the hair coat and wet, muddy cattle lose heat readily. Bedding is not as effective during cold rain and/or snow. Calves provided with no bedding have less insulation, carry more mud and perform poorly. Cattle need protection from the wind, especially during periods of cold temperatures. This protection can be provided by wind fences or shelterbelts. Wind fences in combination with mature trees provide excellent protection. Multiple trees rows of varying height and maturity planted 50 to 100 feet upwind from the feeding pens slow the wind and allow drifting snow to drop among the trees, reducing snow load in the feeding pens. Cattle fed in pens with mature shelterbelts to the north and west of the wind fences gained 0.25 pound more per day during the winter than similar cattle on the same diet in pens with only a wind fence for protection (Anderson and Byrd, 1993). Shelterbelts should not be grazed because the damage from grazing will shorten the life or possibly even kill the trees and significantly reduce the wind and snow protection afforded by the trees, underbrush and grasses between the rows. Tree planting information is available from local Natural Resources Conservation Service offices. Wind fences can be permanent or portable structures set up as part of the fence line or placed inside the pens for access on all sides. Wind-fence construction information is available in the “Beef Housing and Equipment Handbook” (1987). Ideally, pens should be oriented to slope to the south, 3 to 4 percent, for increased solar radiation. Because of the increased solar radiation, every degree of slope is roughly equivalent to moving the feed yard 75 miles south. In large feed yards, bedding procurement and spreading are logistical challenges. However, the value of bedding to cattle performance and comfort outweigh the costs. Feeding trials at the NDSU Carrington Research Extension Center (CREC) with finishing cattle on the same ration indicate improved gains (0.86 pound/head/day) and efficiency when cattle were bedded with modest amounts of straw, compared with no bedding (Table 1) (Anderson et al., 2007). In this study, bedding was provided at 3.2 pounds per head per day, but in commercial feedyards with larger pens, economies of scale may reduce the amount of bedding per head. Carcass traits and the percent of U.S. Department of Agriculture Choice carcasses also were improved markedly by providing bedding. Bedding increased net return in this study by more than $80 per head after accounting for costs of bedding. Bedding also can improve gains in muddy and wet conditions (Mader, 2011), with an approximate rule of thumb of 1 pound of bedding per head per day for every inch of mud. In this scenario, 4 inches of mud in a pen of 100 head would require one bale (800 pounds) of bedding every other day. Bedding may be spread with a loader equipped with a grapple fork or bale shredder, or a “straw cannon” can be used to blow bedding into pens from the feed alley (see photo). In other research at the Carrington Research Extension Center, different bedding materials were compared. Crop residues, including cereal grain straw, corn stover and soybean residue, were used as bedding for finishing steers during the winter. Straw and soybean residue supported better performance than corn stover because feedlot cattle tended to eat the corn stover, reducing the energy density of the intended diet and thus reducing gains. Adequate fiber in the ration (about 15 percent forage) will satisfy cattle and considerably reduce bedding intake. Anecdotal experience suggests intermittent bedding of cattle fed 90 to 92 percent concentrate diets can throw cattle off feed and cause bloat. We recommend that cattle be bedded after they have been fed to reduce consumption of bedding. An additional benefit of bedding is to create a more ideal carbon-nitrogen ratio, enhancing sequestration of nutrients in the bedding pack and composted manure. In research conducted at the CREC, the bedding-manure mix contained greater concentration of nutrients and had more value as fertilizer than manure without bedding (Anderson et al., 2007). Straw mixed with manure apparently limited the volatilization of ammonia in particular, essentially sequestering more nitrogen in the bedding pack. Because of the colder temperatures and the practice of bedding cattle, we hypothesize that feeding cattle in colder climates may be more environmentally benign than in warmer regions because volatilization of ammonia does not occur as readily in cold and frozen environments. Because newly weaned calves or calves that have just arrived at the feedlot can have multiple stress factors, these calves should be started on feed in the most protected pens and provided ample bedding during harsh winter weather. Calves fed modest energy diets (52 megacalories of net energy gain per pound or more) tolerate severe cold better and can generate more heat than animals fed low-quality forages. Thin steers or replacement heifers may be more susceptible to the physical stress of severe wind chills and can become “cold soaked,” which may reduce thriftiness and gain for several weeks and potentially lead to health challenges. Drifting snow may fill feed bunks, which should be cleaned out with a scoop shovel or tractor-mounted mechanical bunk brush or bunk blower. In some cases, feeding on top of modest amounts of snow in the feed bunk may be acceptable. Snow can be stockpiled temporarily in the pen if room is available and time for hauling is limited. Snow in pens should be removed prior to spring thaw to minimize muddy conditions. Move snow to an area where runoff enters the containment because snow in the pens inevitably mixes with manure. Snow from alleyways and clean areas can be moved to areas where runoff is diverted away from containment structures. Ice and snow buildup on the aprons behind bunk lines and around water fountains may have to be removed occasionally during the winter. A backhoe with a spike or a payloader works well for this task. 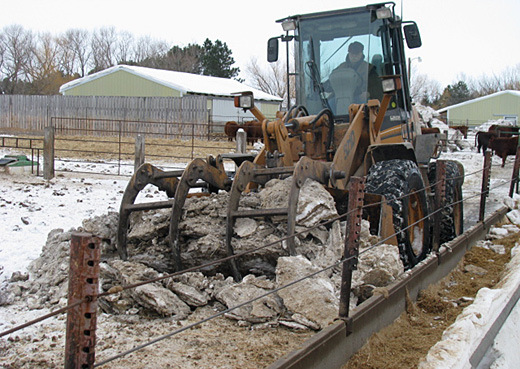 Removing ice and packed snow buildup will provide better footing for the cattle and easier access to feed in the bunk and water in the fountain. Water fountains or tanks should be checked every day during severe cold to be sure water is flowing and cattle can drink. Limiting water can reduce feedlot performance greatly. Gently sloping mounds are ideal, allowing for box scraping and snow removal in the pen, yet providing a well-drained area that may be bedded. To insure proper spring drainage, snow and ice should be cleared from around pipes, culverts, solid separators and diversion ditches to allow free flow of snowmelt, especially where blockages and overflows have been observed in previous years. Prepare for winter storms by having snow removal equipment mounted, tested and ready. Electric service interruptions from ice storms or high wind may necessitate the use of backup generators. Identify extra people who can help if emergency staffing is needed. Feeding calves inside closed buildings requires increased management skills, labor and bedding. Air quality is a major issue inside buildings, with ammonia concentrations from poorly ventilated structures affecting respiratory efficiency and health. High humidity and crowding can reduce the insulating ability of the hair coat. 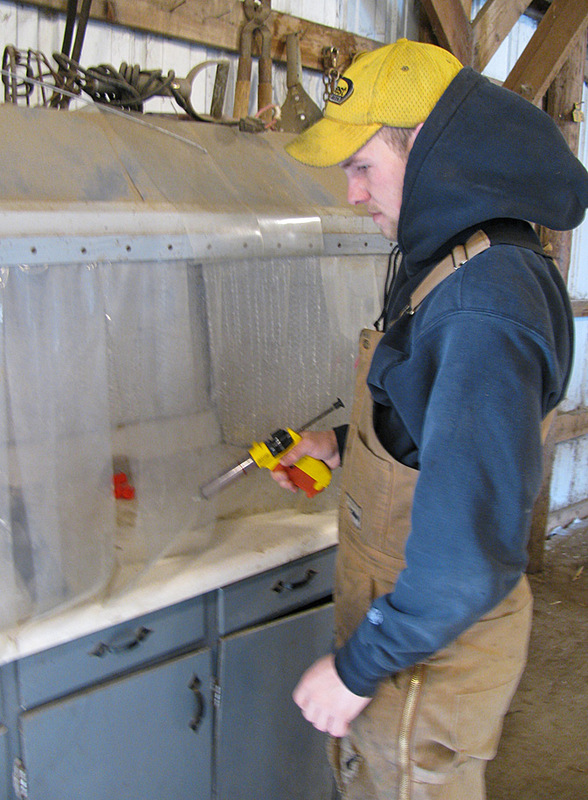 Ventilation of closed barns in cold weather can be particularly difficult. Moisture often accumulates on the ceiling and may drip on the cattle inside the barn. Diseases, especially respiratory diseases, are easily transmitted inside a crowded building. New hoop barns or monoslope structures with precise management guidelines for bedding and ventilation provide a more consistent environment, but improved animal performance is necessary to pay for the structure and management needs. Cold weather generally tends to increase feed intake. Cattle consume 105 to 110 percent of predicted intake when temperatures drop below 22 F and up to 125 percent of predicted intake at less than 5 F (NRC, 1981). Severe cold (wind chills of minus 20 F or lower) may reduce intake because cattle are reluctant to come to the bunk. Including feeds with higher digestibility in the ration, that is, better quality forage, will allow cattle to compensate somewhat for increased energy needs. Cattle may not come to the bunk as readily or stay as long during windy weather, potentially resulting in wasted feed that is brushed or blown out with snow accumulations in the bunks. A storm ration with increased forage proportion may be helpful to maintain a stable rumen environment if severe weather creates inconsistent feed delivery. The amount of forage in a storm ration is based on other ingredients in the ration, but 20 to 25 percent is not extreme. However, increasing forage in the diet will decrease energy density and increase bulkiness of the diet. As a result, the rate of passage may increase and time for feed to be digested in the GI tract may decrease. In extreme conditions, hay may be fed separately to keep the rumen functioning, but cattle must be re-adapted to high-energy diets after the storm. Very high levels of moist feeds (corn silage, wet distillers grain, wet corn gluten feed, potato waste) are not recommended during cold winter weather because these feeds can freeze in the bunk, reducing consumption. Frozen feed requires significantly more energy to thaw in addition to the energy needed to heat the feed to body temperature. The effects of ingesting frozen or cold, wet feed on rumen function are not known. Winter is a challenging time to feed liquid supplements because liquids should be stored in an insulated structure and kept above 32 F. Distribution of liquid feeds in a mixer may be compromised because liquid feeds and coproducts may ball up when poured on very cold forages and grains. Bunk calls for feed delivery should not be made beyond normal adjustments, such as 5 percent of intake or 1 pound per head. Feed intake during a storm may be reduced, and after the storm, increases should be made gradually. Cattle should be fed at the same time each day if possible, so any snow removal or bunk cleaning should be done to accommodate the feeding schedule. Self-feeders are an option to bunk line feeding, especially for small producers, but require periodic checking to ensure feed is available. Ingredients can be mixed on-farm with care and if good techniques are used to create a homogenous mix. Winter feeding with self-feeders minimizes equipment operation. Calf performance may not be quite the same as with a total mixed ration, but the equipment investment and time for feeding is reduced significantly. Make sure cattle have adequate amounts of clean water available at all times. Automatic heated water fountains are the most common method to supply water to feedlot cattle, although most require energy to keep them from freezing. Clean the water fountain basins often, and check water temperature to ensure thermostats are working and not drifting to higher temperatures. While water temperature has not been studied for effects on gain or feed efficiency, heating water excessively does have an energy cost that must be offset by improvements in gain or feed efficiency. To reduce the energy use of commercial water fountains, consider adding insulation on the inside. and cover the concrete slab inside the housing of the fountain as well. Consider covering the exposed water surface with an insulated float. The “Beef Housing and Equipment Handbook” (1987) states that 16 head of feeder cattle can drink per foot of water fountain or tank perimeter when cattle in a feedlot have continual access throughout the day. Cattle drink less during periods of very cold weather and rehydrate within a few days when temperatures moderate (NRC, 1981). Avoid marketing calves during or just after a period of severe cold if possible. Calves arriving at the feedlot during severe cold weather may be dehydrated and need special attention to ensure they rehydrate and start on feed. Extreme winter weather can result in hypothermia and ultimately result in death. Cattle that suffer hypothermia or frostbite are more prone to other disease conditions and certainly do not perform as well as cattle that are warm, dry and out of the wind. Pens designated for sick animals need to be designed to minimize the effects of the elements on the cattle and allow the cattle easy access to feed and water. Any hindrance to obtaining feed and water not only lengthens the number of days the animal is sick, it also increases the risk of the animal dying. Sick animals cannot maintain body temperature as well as a healthy animal; windbreaks and bedding allow the animal to conserve energy and insulate the animal from the frozen ground. Treating sick animals in the cold poses a challenge for personnel. When transporting or using any veterinary product, vaccines and medications should be kept in a “warm box” at a temperature from 35 to 45 F (2 to 7 C). Vaccines and medications should be kept warm because frozen vaccines can become denatured, and frozen antibiotics can precipitate in the bottle. A portable radiant-heat source or chute-side heated compartment (see photo) works well to provide personnel with an area where they can remove gloves or mittens to safely handle sharp objects such as needles and prepare correct dosages. 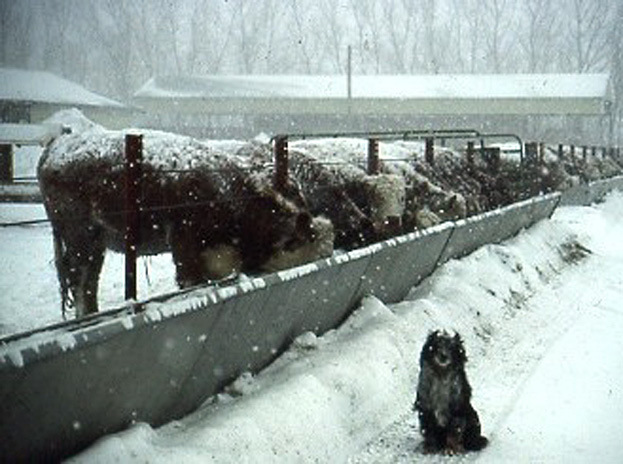 Cattle trucks must be enclosed when shipping cattle in severe cold. Drafts can cause severe frostbite to body parts exposed to holes or open spaces in trucks. Feeding cattle in colder climates has been proven to be economically competitive in the northern Plains region. Cattle are capable of adapting to lower temperatures and maintaining predictable gains if good husbandry practices are used. If at all possible, start cattle on feed before severe weather occurs. If not, provide generous bedding and wind protection in addition to a nutrient-dense diet and aggressive preventive health-care program. The challenge for feedlot operators is to manage their resources to provide the optimum conditions for cattle to thrive regardless of the elements. Anderson,V.L., and J. Byrd. 1993. Effect of shelterbelt protection on performance of feedlot steers during a North Dakota winter. Anderson, V.L., E. Aberle and L. Swenson. 2004. Effects of bedding on winter performance of feedlot cattle and nutrient conservation in composted manure. NDSU Beef Feedlot Research Report. Vol 27:30-37. Anderson, V.L., and R.J. Wiederholt. 2007. 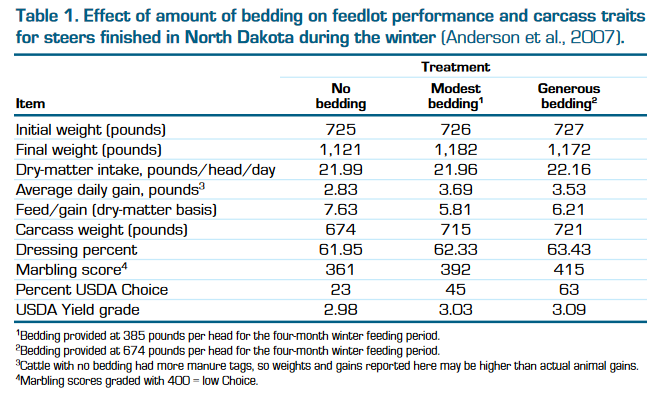 The performance, economic, and environmental value of bedding feedlot cattle during northern Plains winters. J. Anim. Sci. 85:19 (Suppl. 2.) Abstract. Mader, Terry. 2011. Mud effects on feedlot cattle. Nebraska Beef Cattle Report, Page 82-83. MidWest Plan Service. 1987. Beef Housing and Equipment Handbook. 4th Edition. MidWest Plan Service. Iowa State University, Ames. National Research Council. 1996. Nutrient Requirements of Beef Cattle. 7th Revised Edition. National Academy of Sciences. Washington, D.C.